The salmon didn’t show in sufficient numbers to allow any significant commercial fishing, with just 128 sockeyes landed. The state ferry made an extra stop as if to evacuate refugees. And now the Chignik salmon fishery has been officially declared a disaster. Gov. Bill Walker declared an economic disaster for the Chignik fisheries region on Aug. 23, including Chignik, Chignik Lagoon, Chignik Lake, Perryville, and Ivanof Bay, which depend on salmon for both subsistence and commercial harvests. The request for a disaster declaration from the Bristol Bay Native Association warned of winter hardship. “Without the salmon returning, they will not be able to purchase home heating fuel, electricity, gasoline, propane, basic food necessities, mortgage payments, boat expenses, and financial obligations to the state,” according to BBNA. Last year, Chignik fishermen caught a total of about 1 million sockeye, accounting for 45 percent of the total paid to salmon fishermen of $15.8 million, with 41 percent of the ex-vessel dollars paid for pink salmon. The 67 permit holders fishing in 2017 earned an average of $236,000, including kings, chums and coho, according to the Alaska Department of Fish and Game. In June, ADFG Commissioner Sam Cotten said the salmon run was the worst since Alaska became a state in 1959. A few weeks later, it improved but not by much, upgraded to the worse since the 1960s, according to ADFG Biologist Lisa Fox. 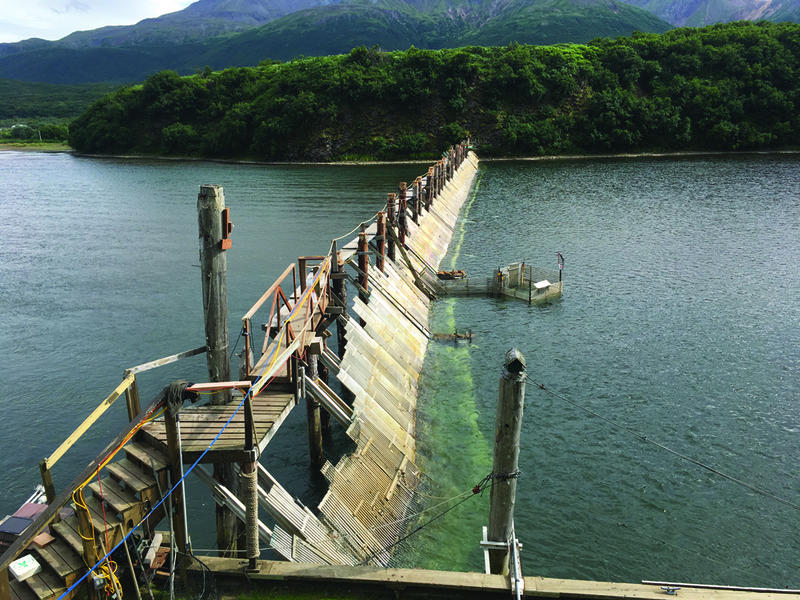 While he still had hopes for the second run, the fish counted swimming through the Chignik River weir provided the same sad story as the first run to a different lake in the two-lake spawning grounds. In the only fishing period on July 7 and 8, fishermen landed a paltry 128 sockeyes, 124 chums and 6 pink salmon, according to Lucas Stumpf of ADFG. “It’s pretty sad. It’s a terrible year,” he said. That opener was aimed at pinks and chums, and only six vessels participated. There were no fishing periods targeting sockeye. As the Chignik salmon disaster continued, the Alaska Marine Highway System doubled the stops on the Aug. 8 -14 Aleutian Islands trip on the state ferry Tustumena, as fisheries workers departed early. The ferry was originally scheduled to stop only once in the Alaska Peninsula community while southbound to Unalaska/Dutch Harbor. An additional Chignik stop was added on the return trip to Kodiak, according to ferry spokeswoman Aurah Landau. ADFG biologist Dawn Wilburn said in a normal year, fishing continues the whole month of August. And in more bad news, she said the pink salmon run also failed. Warmer ocean temperatures are a suspected cause, she said. While subsistence salmon fishing was available, the harvests were small, though the numbers won’t be known until early next year, after the deadline for subsistence catch figures to be sent to Fish and Game, Wilburn said. And even as the season wound down with next to nothing, the salmon-counting weir had to be pulled early, as it had started washing away in the rain-swollen Chignik River, Wilburn said. The economic disaster declaration allows the state Legislature to appropriate money for assistance grants and allows the governor to make budget recommendations to accelerate the region’s existing capital projects and provide funding for new ones. It also waives specific provisions of Alaska statute and regulations relating to capital project requirements, employment, and contractor preference. In addition to the disaster declaration, Walker directed the Division of Economic Development to commit as many resources as possible to assist salmon permit holders who participate in the Commercial Fishing Revolving Loan program and may be unable to meet the terms of their loans because of Chignik’s low harvest. With a preliminary harvest count of 128 sockeye salmon, the 2018 sockeye harvest was only .00922 percent of the prior 10-year average. Escapement counts for 2018 for all salmon in the Chignik Management Area (as of July 29) are 54 percent of what they were on the same date in 2017, according to the governor. Additional support for Chignik area residents is available from the Division of Public Assistance, which provides food relief and financial assistance to Alaskans in need. The division offers programs such as the Heating Assistance Program, the Supplemental Nutrition Assistance Program, and the Alaska Temporary Assistance Program. For information about the Division of Public Assistance, visit dhss.alaska.gov/dpa. More information about the Division of Economic Development is at commerce.alaska.gov/web/ded.